Many people find that creating their own webinar video allows them to get their voice heard, whether this is a personal quest or a business one. If you are considering making these types of videos yourself, you might want to make use of high quality webinar listings that enable you to promote your video to others out there who might be interested in it. There are many different things that you can do if you are trying to promote a new webinar video that you have created to get it known to the public. One of your first steps is going to be to actually create the video itself. There are a few ways that you can accomplish this. You can take the video on your own using your own webcam or camera. You can then upload the video onto the Internet so that other people will be able to view it. Another way to accomplish this is by using a site that allows you to actually record and upload the video on their own webinar platform. Some of these types of sites will charge for their services, so it pays for you to check into this before using their site. For most people, they will record their video on their own and then just upload it to the net. One of the absolute best ways to promote your videos is by using a site specifically dedicated to webinar listings. The reason these sites are so crucial to those who want to get their voice heard is because the site itself is often being used by people who want to listen to a variety of different webinar videos. You’re not simply uploading a video that people may or may not be interested in. The listing site is specific to these types of videos, and the people using this type of site are looking for these videos so that they can watch them from home. Another great thing about a listing site is that it puts videos into categories, which is going to help you if you’re specific to one subject. Let’s say that you like to talk a lot about politics and other things of this nature, your videos will be added to the right category so that people who specifically want to watch webinar videos that talk about politics can do so right from their home computer. Social networking sites are also a wonderful way for you to promote your new webinar video. The reason for this is because most social networking sites are free for you to use and upload videos to. You will be able to add followers, friends and other like-minded individuals so that you can easily have them watch your video. It’s great to know that there are many sites out there that are dedicated to getting your voice heard. The best thing for you to do is to utilize a variety of promotional methods so that your webinar videos get out there to the public. Between a listing site to social networking, your new videos will get the audience that they deserve. Be sure to put the time and effort into your videos so that the public finds them interesting and educational. Both companies and instructional facilities have turned toÂ teleseminar servicesÂ for training purposes. While most people think of a teleseminar as just a meeting or conference that takes place over the telephone, it is probably for delivering a lecture, class or workshop and also ensures students have access to all the necessary training materials that are not likely available in their local communities. Unlike other types of training that require students to be in a classroom or training/conference room, the teleseminar training session takes place over a teleconference line. In order to avoid the chaos that is likely to infiltrate a class involving so many people, there are guidelines of etiquette that have been created in order to allow things to move along smoothly. The teleseminar training session can be something that occurs just one time or it can be an ongoing event that may continue for weeks or months. It may even comprise a series of short courses that take place over time. There may also be homework involved when students participate in a series of teleseminars; this work will be assigned for completion in between the teleseminar classes. Teleseminars are usually in audio format and as a result don’t provide students with visual aids that make the learning process easier. This means the leaders of the teleseminars must provide students with those visual representations either as attachments to the students’ email or downloads from the teacher’s website. The visual handouts are usually in PDF format so the majority of students can open the materials, but some leaders use other formats such as Excel, Power Point, Flash and other types of materials that will enhance the learning experience. There are two basic types of teleseminars: lecture and interactive. During the lecture type of teleseminar, the leader of the class provides students with a set agenda during a period when students simply listen to the information the leader provides. If the leader provides an interactive teleseminar, the lecture is part of the class, but there is also a period of time during which students can ask questions and participate in exercises related to the material the leader presented during the lecture period. The teleseminar learning environment is beneficial to students in many ways. Many adult students are very busy trying to work and attend school at the same time, so it allows them to obtain training in various areas in short, one-hour increments where they don’t need to leave their homes or offices. This type of learning even allows students to obtain training while they are away on business trips. The fact students do not need to travel the company has no costs associated with hotel or travel expenses as a direct result of the training. Companies that offerÂ teleseminar servicesÂ are very popular in today’s busy learning environment. Teleseminar training sessions are beneficial not just for companies but also as a means for adults to learn things on their own that may help them advance in their careers. The interactive teleseminar environment is probably the best way for students to learn although the lecture is able to pack more information into a short period of time. Both has advantages and disadvantages that only the student can assess on an individual basis. A teleseminar is a seminar conducted over a telephone conference call (usually long distance), for a fixed time with a set maximum number of participants. It is typically in a one to many direction, with a presenter broadcasting to the participants via a “bridge” line or teleseminar service. Although the technology allows for the participants to respond as well, most tele seminars do not use that feature during their presentations to keep the background noise of the participants to a minimum. The tele seminar takes place over a phone line where the presenters and the participants dial into a bridge line that connects all of the callers to the presenter. 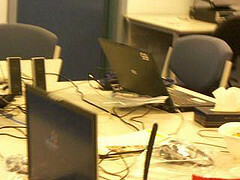 After dialing the number, participants enter a pass code to access the teleconference call. Typically, the presenter has access to controls on the bridge line like starting the presentation, muting callers and starting and stopping recording of the call if that last feature is available with the service. A teleconference, similar to a tele seminar is the live exchange of information among persons remote from one another but linked by a telecommunications system (usually phones). Teleseminar services are used as a cost effective method to disseminate information in an effective fashion. It could be compared to a webinar, where each participant watches a streaming forecast over the Internet, except teleseminars generally take place over the telephone. Teleseminars are one of the most cost effective ways to disseminate information in a live venue over an unlimited geographical area. *Costs are usually divided between the presenter (using a bridge line plus any long distance charges), and the participants (if long distance charges apply). * The presenter can opt to cover the charges of the participants through the use of an 800 number, however that is not an option that is often used by presenters today. There is also the possibility of broadcasting teleseminars over the web, depending on the system being utilized. Teleseminars are also one of the best ways of converting prospects into customers of higher ticket items because they provide a more personal interaction with the client base than a sales page or video would do. Conversion rates of 20 to 30% are common for professionally structured teleseminars. A webinar is a very helpful tool that allows people to share their information in a unique way. The ability to interact with the audience while hosting a webinar is one of the primary attractions for people producing a webinar. However, sometimes people let this fact overshadow their common sense. Even though the interactivity of the webinar is one of its primary benefits, it does not mean that it cannot be beneficial to those who experience it later via a recording. Here are some of the major benefits of recordingÂ webinar listings. One of the primary reasons to record a webinar is that it can be very helpful for training people. When a particularly effective webinar has been created, it often can be lost forever because so many people fail to record their webinars. However, those who always record their webinars will never have to face this frustrating scenario. Whenever they create a particularly informative webinar, they will have a recording that they can use anytime in the future. They can use this webinar recording to train others months or even years down the road. This is reason enough for everyone to take advantage of the ability to record their webinars. This may be the most important reason to record webinars for many webinar producers. When someone is creating a webinar about a difficult topic that involves several concepts that are hard to grasp, it can be very difficult for the audience to soak up all the information in one setting. If these intellectually challenging webinars are not recorded, then the audience will have no way to further their understanding down the road. However, if the challenging webinar is recorded, the audience can watch it as many times as they like until they start to grasp the concepts. This makes it much easier for the audience to grasp the gist of an intellectually challenging webinar. Anyone who is creating a webinar about a difficult topic needs to be sure to record it to ensure that it can be digested repeatedly for comprehension. Most webinars do not have audiences who are particular punctual. In fact, many times half the audience will show up late for a webinar. For those who attend webinars that are not recorded, they will forever miss the content that they show up too late to see. However, if they are attending a webinar that is being recorded, they can go back at their leisure to watch any material that they miss by showing up late. Recorded webinars make for a very effective marketing tool. One of the best ways to use recorded webinars is as a promotional device on social media. 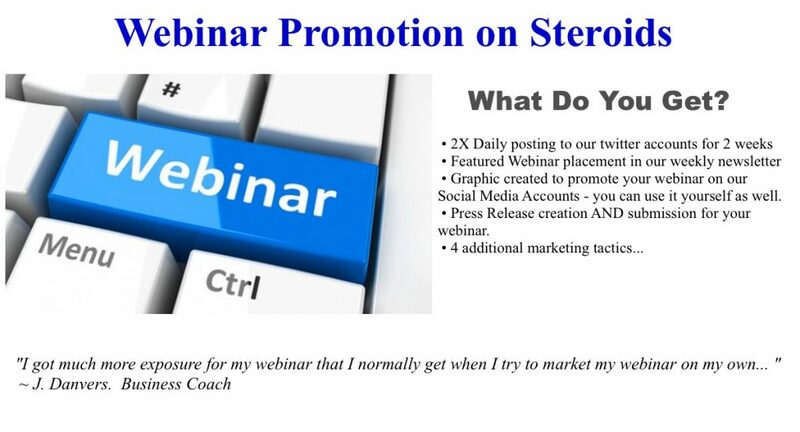 Webinar creators can tweet or share on Facebook past webinars to create interest in new webinars. When people get to see how effective a past webinar was, they will be much more likely to show up for upcoming webinars. Smart webinar creators will always drum up interest in their new webinars by promoting the effectiveness of their past webinars. They need to be sure to share these webinars frequently in the lead up to their events. In this manner, they will capture a larger audience and ensure the success of their webinars. 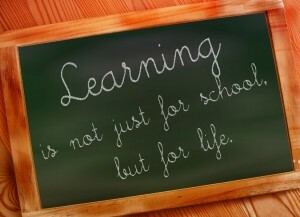 There are many modalities of learning these days thanks to the advancements in technology. Â Many online learning management systems, webinars, teleseminars, videos, forums, chants and social media make it possible for anyone to learn just about anything from anywhere around the world. Â The biggest key is knowing where to find these sites that are focused on education are found. Â Directories that list these online classes are one easy way. Â Read on to find out more about how these type of resource sites are very helpful. Webinars have become an outstanding and affordable means for learning, developing skills and networking through the convenience of the Internet. If you were to peruse webinar listings, you’d find there is a vast array of subjects for giving, receiving and discussing information. From real estate to technology, webinars offer everyone the opportunity to explore new territory or to expand their knowledge of an existing skill. Good webinars create the classroom experience in virtual settings. The delivery and structure can go in any direction or take any form, but there needs to be a reasonable exchange of information and objective for your audience. There also needs to be a clear understanding that the Internet is global. Your webinar could be seen essentially anywhere in the world. There should be particular attention paid to avoid mystifying the subject. The lessons should be clear and concise so that a general audience can engage and potentially interact and collaborate. Outside of tailoring a webinar to a specific subject and ensuring that you develop an entertaining and informative syllabus, there are other things to keep in mind. One of the first is a familiarization of your audience. Conducting a successful webinar will depend on this. If you know your audience and why they’d want to be part of your webinar, you increase your chances of doing it right. There have been more instances than one might imagine where the lecturer was simply sending his work out there, either clueless to the subject or unable to keep the material interesting. Be sure to determine what information you plan to deal with and how. A history of Russia doesn’t necessarily have to include every single moment. You will lose your audience if it gets too wordy or involved. Determine what about Russia’s history this webinar will focus on and go from there. Outline this at the beginning with a few talking points and expand. Use the time length to determine how much information you’ll likely need. Don’t try to cram it in. While a webinar can be as fun, exciting and fast paced as you want to make it, there still needs to be a sense of relaxation and thoughtfulness. Moving too fast or throwing out too much information in short spaces can confuse, distract and annoy your audience. Remember, it’s the Internet. We’ve gotten used to multimedia formats designed to grab our interests through graphics, video, special effects, music, text, links and much more. If at all possible, utilize as many of these as you can. The webinar more than anything has to be engaging. Watching someone drone on and on about SEO on the web is as boring as watching them do it in person, if not worse. Webinars should be online presentations and, whenever possible, should put your audience in the room. There should be Q&A, polls, surveys, chats, hand up indicators and whatever feature that lets the audience become part of the process. These are only a few tips to engineering a well produced webinar. As a matter of fact, you could go through webinar listings and find any number of webinars about organizing an exceptional webinar. Webinars have become extraordinary tools, but the material, the presenter and everything in between needs to stand out.